Matthew 13:9 "He that hath ears to hear, let him hear." Again the kingdom of heaven is like to a net cast into the sea, and gathering together of all kind of fishes. Which, when it was filled, they drew out, and sitting by the shore, they chose out the good into vessels, but the bad they cast forth. So shall it be at the end of the world. The angels shall go out, and shall separate the wicked from among the just. And shall cast them into the furnace of fire: there shall be weeping and gnashing of teeth. And wherein doth this differ from the parable of the tares? For there too the one are saved the other perish; but there, for choosing of wicked doctrines; and those before this again, for not giving heed to His sayings, but these for wickedness of life; who are the most wretched of all, having attained to His knowledge, and being caught, but not even so capable of being saved. Yet surely He saith elsewhere, that the shepherd Himself separates them, but here He saith the angels do this; and so with respect to the tares. How then is it? At one time He discourses to them in a way more suited to their dullness, at another time in a higher strain. And this parable He interprets without so much as being asked, but of His own motion He explained it by one part of it, and increased their awe. For lest, on being told, "They cast the bad away," thou shouldest suppose that ruin to be without danger; by His interpretation He signified the punishment, saying, "They will cast them into the furnace." And He declared the gnashing of teeth, and the anguish, that it is unspeakable. Seest thou how many are the ways of destruction? By the rock, by the thorns, by the wayside, by the tares, by the net. Not without reason therefore did He say, "Broad is the way that leadeth to destruction, and many there be which go away by it." The draw net completes the sevenfold teaching in the first Gospel. The order was chosen by St. Matthew; and if we accept the mystic signification of the number "seven", i.e., "perfection", we shall perceive in this parable not a repetition, as Maldonatus held, of the tares, but its crown. In the tares separation of good and bad is put off; here it is accomplished. St. Augustine composed a kind of ballad for the people against the Donatist schismatics which expresses the doctrine clearly, "seculi finis est littus, tunc est tempus separare" (see Enarr. in Ps., lxiv, 6). The net is a sweeping net, Lat. verriculum, or a seine, which of necessity captures all sorts, and requires to be hauled on shore and the division made. For the Jews, in particular, the clean must be taken and the unclean cast away. Since it is distinctly stated that within the net are both good and bad, this implies a visible and a mixed congregation until the Lord comes with His angels to judgment (Matthew 13:41; Apocalypse 14:18). The Evangelist...has understood this parable, like the others quoted, allegorically, and Christ is the Fisher of men. Clement of Alexandria perhaps wrote the well-known Orphic hymn which contains a similar appellation. The "fiery furnace", the "tears and the gnashing of teeth", going beyond the figures in the story, belong to its meaning and to Christian dogma. Again the kingdom of heaven is like a net that was cast into the sea. (Matthew 13:47) As in the case of images and statues, the likenesses are not likenesses in every respect of those things in relation to which they are made; but, for example, the image painted with wax on the plane surface of wood has the likeness of the surface along with the color, but does not further preserve the hollows and prominences, but only their outward appearance; and in the moulding of statues an endeavour is made to preserve the likeness in respect of the hollows and the prominences, but not in respect of the color; and, if the cast be formed of wax, it endeavours to preserve both, I mean both the color and also the hollows and the prominences, but is not indeed an image of the things in the respect of depth; so conceive with me also that, in the case of the similitudes in the Gospel, when the kingdom of heaven is likened unto anything, the comparison does not extend to all the features of that to which the kingdom is compared, but only to those features which are required by the argument in hand. There, accordingly, The waters brought forth every soul of creeping animals according to their kinds, the cause not being in it; but here we are responsible for our being good kinds and worthy of what are called vessels, or bad and worthy of being cast outside. For it is not the nature in us which is the cause of the evil, but it is the voluntary choice which works evil; and so our nature is not the cause of righteousness, as if it were incapable of admitting unrighteousness, but it is the principle which we have admitted that makes men righteous; for also you never see the kinds of things in the water changing from the bad kinds of fishes into the good, or from the better kind to the worse; but you can always behold the righteous or evil among men either coming from wickedness to virtue, or returning from progress towards virtue to the flood of wickedness. Wherefore also in Ezekiel, concerning the man who turns away from unrighteousness to the keeping of the divine commandments, it is thus written: But if the wicked man turn away from all his wickednesses which he has done, etc., down to the words, that he turn from his wicked way and live; (Ezekiel 18:20-23) but concerning the man who returns from the advance towards virtue unto the flood of wickedness it is said, But in the case of the righteous man turning away from his righteousness and committing iniquity, etc., down to the words, in his sins which he has sinned in them shall he die. (Ezekiel 18:24) Let those who, from the parable of the drag-net, introduce the doctrine of different natures, tell us in regard to the wicked man who afterwards turned aside from all the wickednesses which he committed and keeps all the commandments of God, and does that which is righteous and merciful, of what nature was he when he was wicked? Clearly not of a nature to be praised. If verily of a nature to be censured, of what kind of nature can he reasonably be described, when he turns away from all his sins which he did? For if he were of the bad class of natures, because of his former deeds, how did he change to that which was better? Or if because of his subsequent deeds you would say that he was of the good class, how being good by nature did he become wicked? And you will also meet with a like dilemma in regard to the righteous man turning away from his righteousness and committing unrighteousness in all manner of sins. For before he turned away from righteousness, being occupied with righteous deeds he was not of a bad nature, for a bad nature could not be in righteousness, since a bad tree — that is wickedness— cannot produce good fruits — the fruits that spring from virtue. Again, on the other hand, if he had been of a good and unchangeable nature he would not have turned away from the good after being called righteous, so as to commit unrighteousness in all his sins which he committed. Now, these things being said, we must hold that the kingdom of heaven is likened to a net that was cast into the sea and gathered of every kind, (Matthew 13:47) in order to set forth the varied character of the principles of action among men, which are as different as possible from each other, so that the expression gathered from every kind embraces both those worthy of praise and those worthy of blame in respect of their proclivities towards the forms of virtues or of vices. And the kingdom of heaven is likened unto the variegated texture of a net, with reference to the Old and the New Scripture which is woven of thoughts of all kinds and greatly varied. 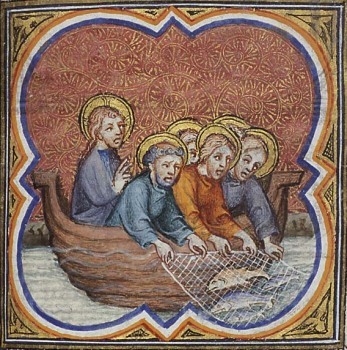 As in the case of the fishes that fall into the net, some are found in one part of the net and some in another part, and each at the part at which it was caught, so in the case of those who have come into the net of the Scriptures you would find some caught in the prophetic net; for example, of Isaiah, according to this expression, or of Jeremiah or of Daniel; and others in the net of the law, and others in the Gospel net, and some in the apostolic net; for when one is first captured by the Word or seems to be captured, he is taken from some part of the whole net. And it is nothing strange if some of the fishes caught are encompassed by the whole texture of the net in the Scriptures, and are pressed in on every side and caught, so that they are unable to escape but are, as it were, absolutely enslaved, and not permitted to escape from the net. And this net has been cast into the sea — the wave — tossed life of men in every part of the world, and which swims in the bitter affairs of life. And before our Saviour Jesus Christ this net was not wholly filled; for the net of the law and the prophets had to be completed by Him who says, Think not that I came to destroy the law and the prophets, I came not to destroy but to fulfil. (Matthew 5:17) And the texture of the net has been completed in the Gospels, and in the words of Christ through the Apostles. On this account, therefore, the kingdom of heaven is like a net that was cast into the sea and gathered of every kind. And, apart from what has been said, the expression, gathered from every kind, may show forth the calling of the Gentiles from every race. And those who attended to the net which was cast into the sea are Jesus Christ, the master of the net, and the angels who came and ministered unto Him, (Matthew 4:11) who do not draw up the net from the sea, nor carry it to the shore beyond the sea — namely, to things beyond this life, unless the net be filled full, that is, unless the fullness of the Gentiles has come into it. But when it has come, then they draw it up from things here below, and carry it to what is figuratively called the shore, where it will be the work of those who have drawn it up, both to sit by the shore, and there to settle themselves, in order that they may place each of the good in the net into its own order, according to what are here called vessels, but cast without and away those that are of an opposite character and are called bad. By without is meant the furnace of fire as the Saviour interpreted, saying, So shall it be at the consummation of the age. The angels shall come forth and sever the wicked from among the righteous and shall cast them into the furnace of fire. (Matthew 13:49-50) Only it must be observed, that we are already taught by the parable of the tares and the similitude set forth, that the angels are to be entrusted with the power to distinguish and separate the evil from the righteous; for it is said above, The Son of man shall send forth His angels, and they shall gather out of His kingdom all things that cause stumbling, and them that do iniquity, and shall cast them into the furnace of fire: there shall be the weeping and gnashing of teeth. (Matthew 13:42) But here it is said, The angels shall come forth and sever the wicked from among the righteous and shall cast them into the furnace of fire.